McDonald's Singapore was very slow off the mark with their World Cup range of promotional items. It seems that most other countries have been running theirs both longer, Hong Kong has been running theirs since early May, and larger, both Japan and Australia are running 4 different burgers along with various sides. Even my former home of Korea has been running the promo "Samba" burger for the past 3 weeks, and they only get 2-3 promos a year! 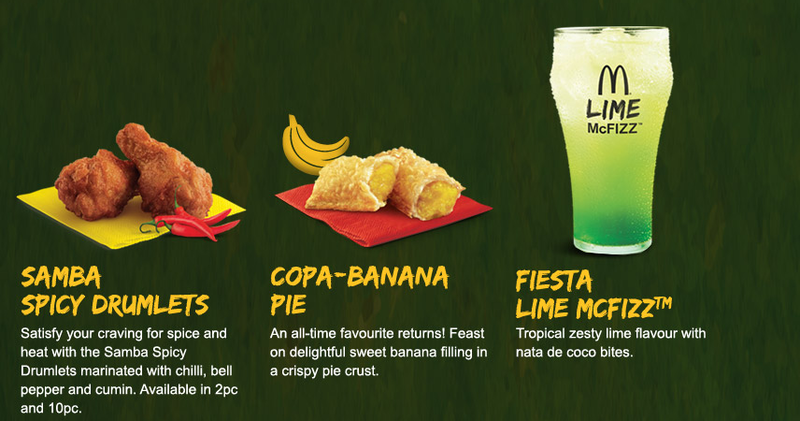 McDonald's Singapore only first mentioned their 2 new promo burgers, the Beef Picante, and the Chicken Caramba, this past Monday. It's probably because Singapore doesn't care about the World Cup. My wife had to take an emergency trip up to Korea on yesterday, so I had to do this review completely on my own. This also meant I did not have anyone to share my meal with, and since the Chicken Caramba seemed very boring, simply a fried chicken patty, with a Sweet Chilli Lime sauce, (which may have just been leftover from April's Sizzling Citrus), I gave it a pass. Not to mention the last 8 promos in Singapore have been chicken or fish, so it was nice to finally have a beef burger again. 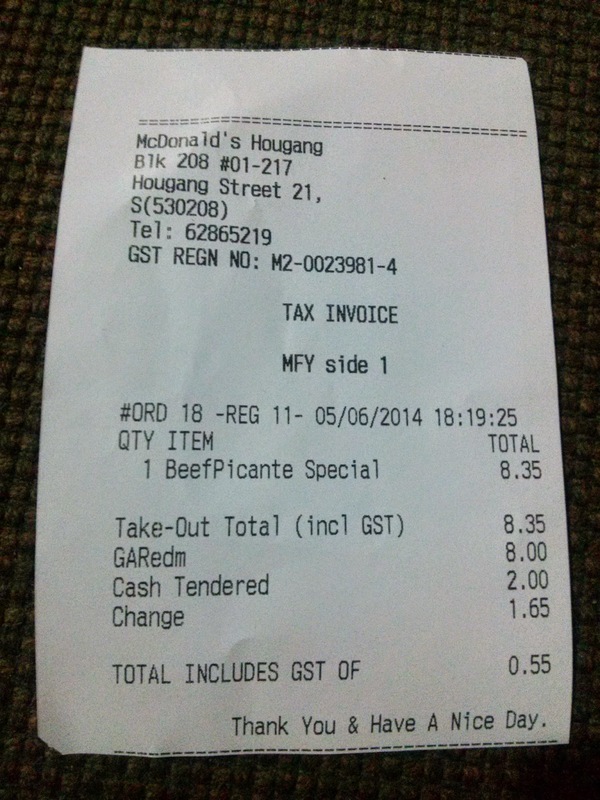 The last promotional beef burger was the Rendang Burger, in July of 2013! If you read that review, I heavily complained about the high price of that combo, and this promo was even more expensive! I paid $7.25 last year for the "special", which includes a McFizz, and this combo cost me $8.35 after the drink upsell! The burgers on their own were $6, so it was simply too high of a price point to also get Chicken the when I knew I wasn't going to finish both. The high price was somewhat offset because this burger not only had a large, Big Tasty size patty, but also two strips of Turkey Bacon. Many people call Turkey Bacon blasphemy, but I actually prefer it, since I find it leaner than pork bacon. But one can get Turkey Bacon every day at breakfast, what makes this burger special was the bun, which was topped with chilli and chives. When I opened the box, I could smell the bun more than the beef! It isn't as interesting as the football shaped buns they have in other countries, and I'm not sure if Chives are natively Brazilian, but the bun was a nice improvement over the standard sesame seed bun. I would have liked it if they had baked the seasoning into the bun, but that may be asking for a bit much. The other selling point of this burger was the new Malagueta pepper sauce, which is a sister pepper to both Peri Peri, and Tabasco. I may have been to over 70 countries, I have only been to Colombia and Ecuador in South America, so I am not that familiar with South American, or more specifically, Brazilian food. Although I love spicy food, this is a pepper I have honestly never heard of before. The sauce was clearly mayonnaise based like most McDonald's sauces, but there were pepper undertones which were different from any of the other "spicy" burgers I've had from McDonald's before. If I could find a similar sauce for sale, I would easily buy it for my home, it wasn't hot by any stretch of the imagination, but it just had a nice flavour, it would make a nice dip. I think I may need to hunt these peppers down to give them an unadulterated try. Here's the full World Cup line-up. 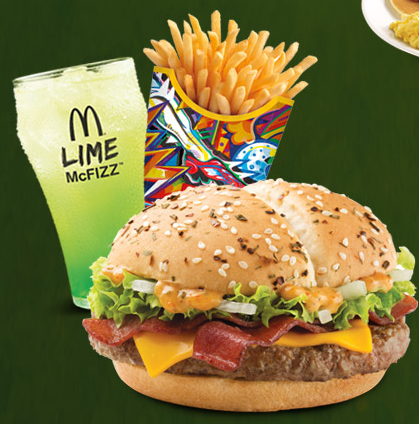 I did order the Lime McFizz along with this burger, so expect the review for that to be posted tomorrow. I may still try the Chicken Caramba, but it might not be for another 2-3 weeks, as I have a new burger to try in Malaysia this weekend. The pie in their promotional photo, is simply a re-release of the Banana Pie, which has made it back 3 times in the last 12 months. Those chicken legs are my worst enemy, Drumlets, the biggest waste of money in the world. I passed on the "Smoky" drumlets last month, and I may pass on these as well. 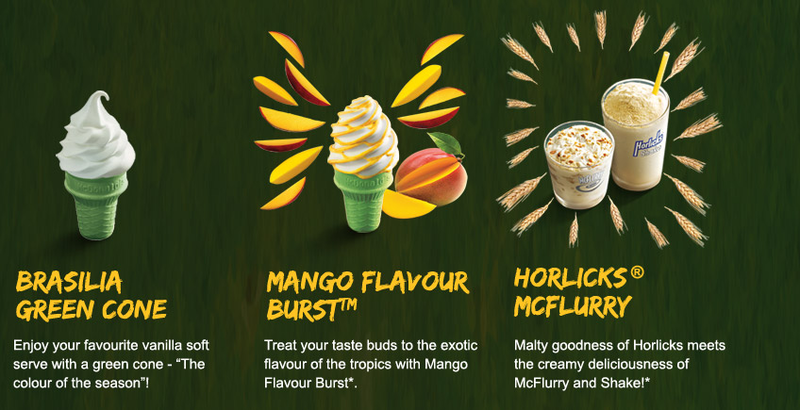 The Mango Flavour Burst, Horlicks McFlurry have also been done many times before. Have they completely stopped salting the fries, like in the US? Nope, they still salt them to all hell over here. Upselling to a larger size is still common as well, although the large is a US medium.